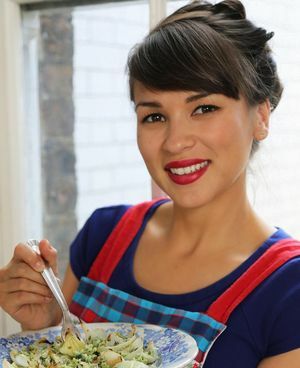 Rosie Ramsden is a chef, food stylist, painter and debut author. 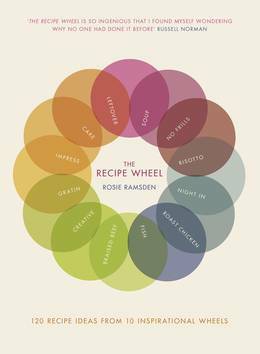 She poured all these talents into her beautiful first book The Recipe Wheel, which showcases her inspirational approach to cooking. Simple core recipes and their exciting variations all use store cupboard ingredients to make creative, satisfying dishes. Rosie's own bookshelves are full to overflowing with titles that evoke the joy of time well spent in the kitchen. Here, Rosie shares with us her reverence for classic food writers and her delight in discovering new favourites. 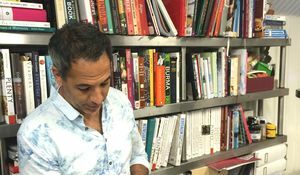 "There are some people that say you can never have too many cookbooks, and looking at my bookcase (shared by me and my husband who is also a cook), it would appear that I am of the same view. New books lie strewn across a coffee table; once-used books are practically hidden, unreachable without a ladder; and the most loved are bent open, earmarked with some pages glued together from the last time they made supper. Each book has its own purpose; most I would have trouble giving away. But when it comes down to that ruthless question: ‘if you HAD to just keep one, which one would you choose’, I’d be able to answer it, without hesitation. It’s a true favourite: photoless, almost pocketsize, with recipes that always spur me on to create. 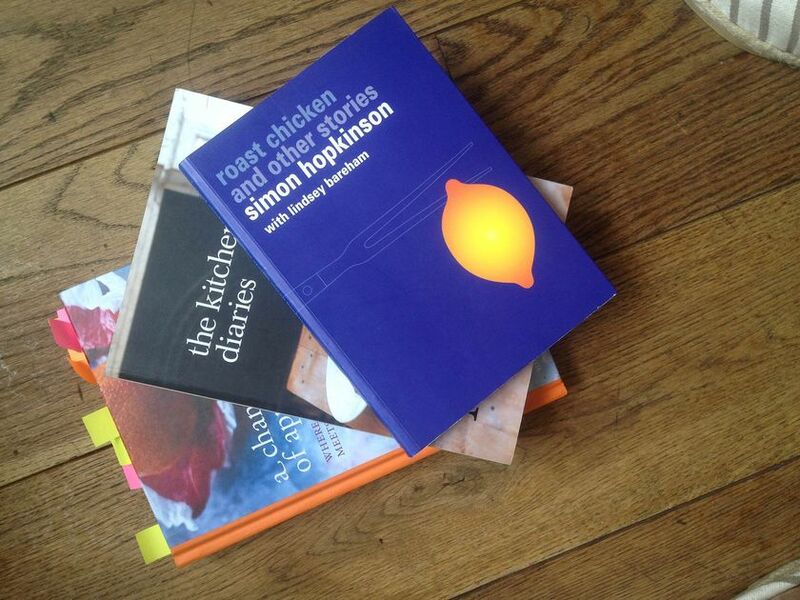 Welcome, Simon Hopkinson’s Roast chicken and Other Stories (and following that, Second Helpings). His recipes are all unfailingly simple, perfect for quick dinners or for turning into something spectacular. It’s not heavy, in weight or in content. It’s an amusing read, a bedtime book. And it’s full of genius illustrations to keep it perky. Glancing through to remind me why it’s so loved, I find pages that are particularly sticky and worn: Bread and butter pudding, saltimbocca (in book 2), gazpacho, and the insanely scrumptious, onion tart. Really good food that I like to eat. But who would really just want to keep one book?? There are two others I’d carry with me everywhere if my handbag could hack it. One is new: Diana Henry’s A Change of Appetite (in fact, every time she releases a new title I update love list, though this one is definitely my favourite so far). The other is Nigel Slater’s The Kitchen Diaries. Every recipe, EVERY recipe, in Henry’s latest book makes me salivate. The combinations of ingredients are ones you’d have in a well-stocked larder, but the way they are put together is intricate and innovative. 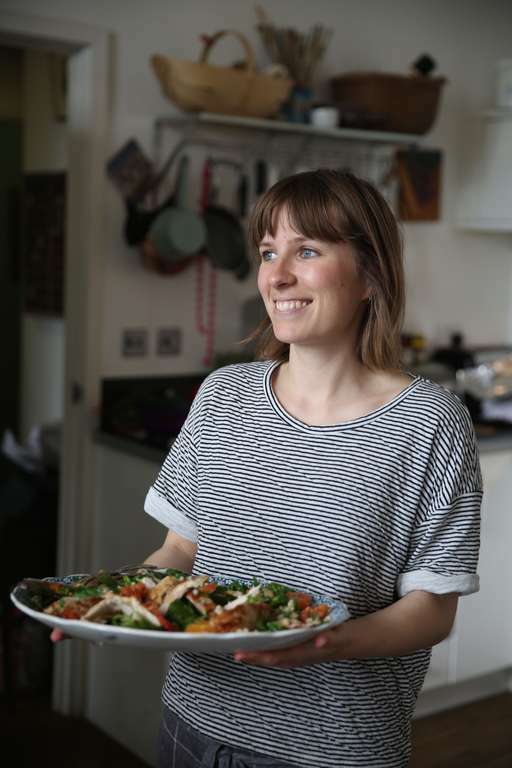 The recipes follow a road for good living and wellbeing – the way we’d all like to eat to stay well: without cutting out the joy and flavour of cooking. It is just what I need when I come home from a busy day of recipe testing, and after cooking and eating something from it I’ll curl up with it for more inspiration. Burmese chilli fish with hot and sour salad, or roast tomatoes and lentils with dukka-crumbled eggs. The images by are utterly stunning, full of colour, and the styling urges you try hard to make something just as beautiful for your own table. It’s a wonderful book. Slater is just brilliant. 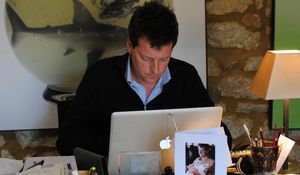 It’s his writing I admire so much, and The Kitchen Diaries is full of it. He writes as though he’s sitting in the same room telling you about yesterday’s lunch, and it’s easy to soak up the excitement about the food that he refers to: ‘a rocket salad with which to wipe our plates’, or ‘corn cobs at dusk’ are words all readers can relate to. This fits alongside any fictional novel I have sitting by my bed, I used it throughout writing The Recipe Wheel for keyboard-tapping ignition, and I adore it (not least because it was the first cookbook my husband ever gave me). These are cookbooks that have inspired me to cook and write new recipes as a result of reading them… I can’t count the amount of times I have leapt into Hopkinson, Henry or Slater’s pages and found instant need to get into the kitchen. These I couldn’t live without."